The WL16, Water Level Logger, is a datalogger and submersible pressure transducer combination designed for remote monitoring and recording of water level or pressure data. The water level logger can record over 81,000 readings and has four unique recording options, fast (10 samples per second), programmable interval (1 second to multiple years), logarithmic, and exception. Multiple depth ranges are available from 3’ to 500’ of water level change. A 25' vented cable is standard on all water level loggers, and optional cable lengths are available from the factory up to 500'. The WL16, Water Level Logger, is housed in a weather-resistant cylindrical enclosure, which slips inside a standard 2-inch PVC pipe. The Water Level Recorders are easily adapted with standard hardware for wellhead mounting, stream, or other installations. Two internal 9 VDC Alkaline batteries will typically power each of the Water Level Loggers for approximately one year even if one of the batteries fails. A third onboard lithium battery ensures your data is safe in the event both 9V batteries fail. All Water Level Loggers include Windows and PDA software, allowing easy upload of data a laptop, desktop or PDA for transfer to spreadsheet programs. NOTE: The Palm operating system is NOT supported. The WL16, Water Level Logger's vented submersible pressure transducer is fully encapsulated with marinegrade epoxy. The electronics are encapsulated so that moisture can never leak in through O-ring seals or work its way into the vent tube and cause drift or sensor failure, as is the case with many other vented sensors. The vent tube is sealed directly to the wet-wet sensing element, and any moisture that may enter the vent tube from the housing will only contact the ceramic parts, not the electronics. Most federal agencies, universities, and environmental consultants recommend vented water level sensors for the best monitoring results. 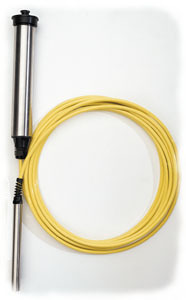 The vented submersible pressure transducer uses a unique silicon diaphragm to interface between your water and the sensing element. The diaphragm is highly flexible and touches the sensing element, producing a sensor with exceptional linearity and very low hysteresis. A stainless steel micro-screen cap protects the pressure transducer diaphragm. The micro-screen cap has hundreds of openings, making fouling the sensor with silt, mud or sludge virtually impossible. PDA software: CE and Mobile compatible. The Water Level Logger includes Global Water Datalogger Software, Windows-based software that provides many useful features, such as real-time readout, measurement interval and engineering unit selection, station ID setting, and sensor calibration. The software makes accessing stored data and setting options easy. Data downloaded from the Water Level Logger can easily be opened in any PC spreadsheet program for analysis and graphic presentation. Globlal Water's Water Level Recorder Software will run on a PC-type laptop or desktop computer running Windows 98 or later. To communicate with the Water Level Logger, a computer must be equipped with a communication port appropriate to the type of water level logger you have, either a standard RS232 serial or a USB host communication port. Purchase of the Water Level Logger includes a RS232 or USB cable (for communication between the logger and your computer). The Water Level Logger's pressure sensor may be placed slightly below the lowest expected water level. Level ranges of 0-3', 0-15', 0-30', 0-60', 0-120', 0-250', and 0-500' are available. When ordering, select the level sensor range that will cover the maximum water level change (this is not necessarily the total depth of water). Selecting the smallest water level range possible will ensure the greatest accuracy. The Water Level Logger's data logger is housed in an enclosure that is designed to slip inside a 2-inch pipe and be completely hidden with a standard or locking well cap. For monitoring groundwater, the water level recorders can be installed in a PVC pipe with the datalogger enclosure's rim resting on the pipe's edge. For monitoring surface water, the water level loggers can be installed in a a protective stilling constructed of PVC pipe. Groundwater Monitoring, stream and river gauging, Lake/Pond Level Analysis, Flood Level Recording, Irrigation Canals, inflow and infiltration studies, Wetland/Estuary Monitoring, Weirs and Flumes, Wave and Tidal Analysis, and MUCH MORE... NOTE: Polyurethane cable is not recommended for use with hydrocarbons or high concentrations of chlorine. Please look at the our WL450 Water Level Transmitter to meet the requirements of these types of applications. SERIAL version for collecting data with most PDAs. Allows water level logger to sit inside 2-inch well with the water level recorder's enclosure rim resting on well casing top. Standard or locking well cap will completely hide the water level logger. Includes Windows-based Global Water Level logger Software and two 9V batteries. When ordering, specify water level range that will cover the maximum water level change for your application (this is not necessarily the total depth of water): 0-3', 0-15', 0-30', 0-60', 0-120', 0-250', and 0-500'. NOTE: There is a $50 extra charge for 0-500' range sensor. Selecting the smallest water level range possible will ensure the greatest accuracy. Includes 25 feet of cable. USB version for collecting data with most laptop/desktop computers. Allows water level logger to sit inside 2-inch well with the water level recorder's enclosure rim resting on well casing top. Standard or locking well cap will completely hide the water level logger. Includes Windows-based Global Water Level logger Software and two 9V batteries. When ordering, specify water level range that will cover the maximum water level change for your application (this is not necessarily the total depth of water): 0-3', 0-15', 0-30', 0-60', 0-120', 0-250', and 0-500'. NOTE: There is a $50 extra charge for 0-500' range sensor. Selecting the smallest water level range possible will ensure the greatest accuracy. Includes 25 feet of cable. Cable length is measured from top of water level recorder to bottom of sensor. WL16 includes 25 feet of cable, and extra cable can be added up to 500 feet. Replace the standard stainless steel water level sensor housing with titanium. Fits over a 2-inch pipe. Entire logger goes down inside the 2" well. Provided with chain and hook to secure the well top. Global Water recommends that no more than 100ft of cable be used with this option. Sensor is housed in a 8" PVC (PRPP) or stainless steel pipe with 3/4" NPT male thread (PRPM) for logging pressure in municipal water systems. 10' cable standard. Calibrated in psi with ranges of 30 psi, 60 psi, 100 psi available. Mouse-shaped cover protects sensor from fouling and velocity effects in sewer, stormwater and irrigation pipe flows. The cover is attached to 4" X 24" stainless steel strap for mounting the level sensor on pipe bottom. 0-50° C, Accuracy: 1% of reading. NOTE: This option does not decrease the storage capacity of the water level logger.